On a rooftop after dark, the Turtles are discussing their legacy. Leo wonders if what they’ve spent their lives doing has any purpose, if they’ll be remembered for it, but Don warns him not to place too much value on what others think. Suddenly, a flurry of shuriken narrowly misses them and a female ninja garbed in an all-black body suit and mask appears. Leo suspects she wants to challenge them. Don decides to go first and quickly gets a light kick to the nose from the girl. Raph tells him to tap out and attacks. The ninja girl uses her cape to blind Raph, trips him, flips him over and steals his sai. Impressed, Raph yields. Mikey jumps in, but the ninja girl uses a smoke bomb to disappear. Reappearing on a ledge above him, she lightly bonks him on the head. Leo tells the ninja girl that they’re impressed. Particularly, they’re impressed that her time in college didn’t dull her edge. The ninja girl pulls off her mask and reveals herself as Shadow Jones and says that she wanted to show them that she’d been keeping in practice while away. Leo gives her a hug and welcomes her home while Raph assures her that he and his brothers were going easy on her. *As Shadow has just finished college, this story must take place sometime in the future era of the Mirage universe. 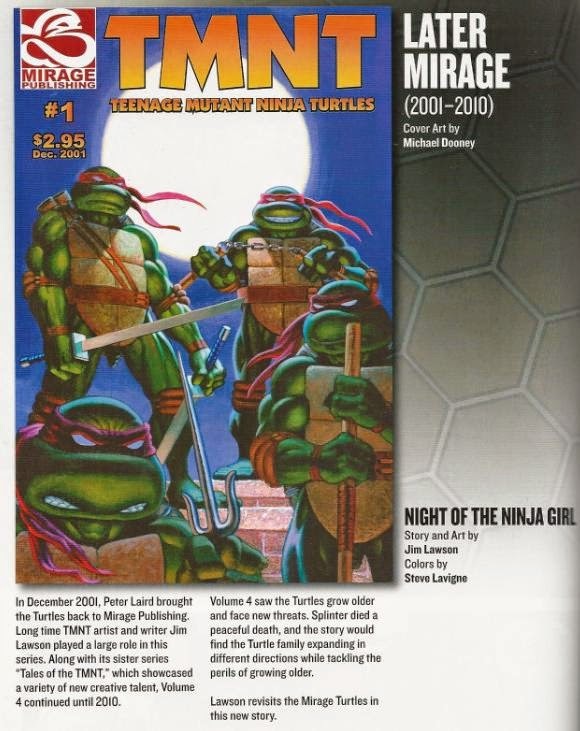 Not too distant in the future, obviously, but it can’t take place concurrently with TMNT Volume 4. The lesson in “Night of the Ninja Girl” is sort of a thematic callback to “Sons of the Silent Age”, albeit on a very different level. In that older tale, Raphael was the one pondering what he and his brothers will leave behind after they’re gone, considering they can never have offspring and that their ninja nature means they have to live forever in secrecy. Leonardo sort of refreshes that sentiment with this story, occurring much further down their timeline, as he wonders who will remember them after they’ve gone and if any of their adventures were even worth it, as they won’t leave a ripple in history. Obviously, Shadow turns out to be the answer he’d been overlooking. They taught her their various martial arts and skills, and she’s been keeping that knowledge alive even when away and all by herself at college. While they can’t have kids of their own and their adventures can never be recorded, the Turtles CAN pass down their knowledge to others who’ll in turn pass it on and so forth. Hence, they WILL leave a legacy behind. If “Sons of the Silent Age” was a more cynical take on the message, “Night of the Ninja Girl” tries to steer it around into something a bit more hopeful. I think it has a little extra impact, as Leo’s pontifications come as he finds himself in middle age and the thoughts of mortality and what you’ll leave behind transcend brief musings and become something very serious. When taken by itself, “Night of the Ninja Girl” might be a forgettable short, but when looked at in the overall tapestry of the Mirage universe, it serves a valuable purpose. And in regards to the “overall tapestry of the Mirage universe”, the story also has an unfortunate dark side to it. The story “Dark Shadows” shows us Shadow’s inevitable future and it’s not pretty. In particular, the legacy the Turtles have chosen to leave behind through her will wind up causing her nothing but pain. 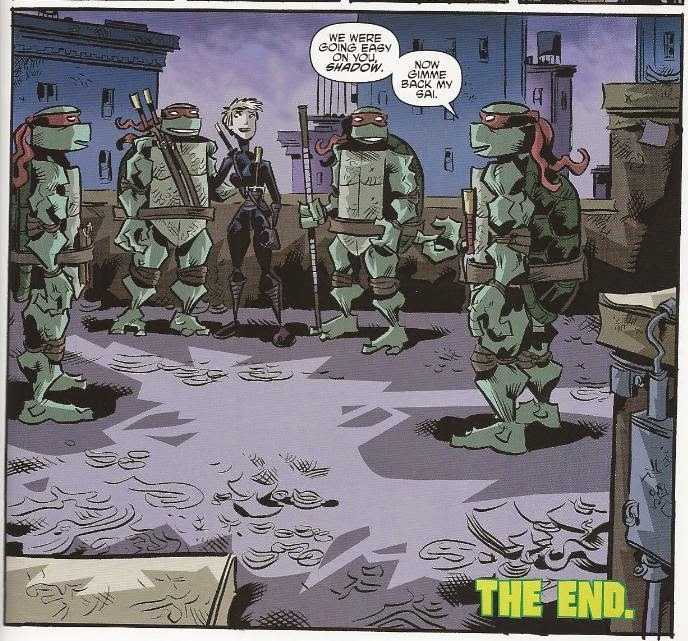 The epilogue of that issue explains in plain language that if the Turtles teach her their martial arts knowledge, it will be the catalyst that sends her down the path of self destruction as seen in the main story of that issue. The alternative, not teaching her what they know, will leave her unprepared to defend herself from a future attack and she’ll die at a young age. A Catch 22, and one better discussed in my review of that issue. But for this story, you see the Turtles happy and proud that their legacy will live on through Shadow. However, it’s that legacy which will ultimately destroy her and strain the relationships of all four Turtles. So I guess this story IS pretty cynical and depressing when you think about it. "Life at best is bittersweet," eh? And, yes, the Lavigne colors look great. Yeah this story feels quintessential later Mirage to me for just that reason Adam. A really good short considering how sad the happy ending is. On overall, this 30th Anniversary book was a nice treat. You could look at it as cynical, or it is truly hopeful. It depends on whether you think the future in "Dark Shadows" is the "true" future of the Mirage universe. I do not see it as so. The future can be changed as the staff and Renet explain.